Taal Volcano right after the 30 January 1911 eruption. Original photo from John Tewell on Flickr. “Tiny” Taal Volcano, at just 311 meters or 1,020 feet above sea level considered the world’s smallest active volcano, is also among the deadliest1. It has had a total of 33 historical or documented eruptions2. One of these, the 1754 eruption, lasted for almost seven months and redefined the terrain in the Taal-Lemery area, closed off Taal Lake’s access to Balayan Bay and changed its waters from marine to freshwater. Next to this terrain-redefining eruption, the most notable and especially so because it occurred in the modern era, was the violent 1911 phreatic eruption3 that hurled rock fragments called tephra into the atmosphere, caused 25 to 80 centimeters of ash-fall and acid rain, formed seiches4, generated shock waves and caused the fissuring or breaking of terrain. The base surge5 from the explosion obliterated the barrios on the volcano island and ash-fall affected the towns of Talisay, Laurel, Tagaytay and Agoncillo. In all, 1,335 people were killed by the eruption1. A total of 2,000 square kilometers was affected. Ash and other volcanic debris fell as far away as Manila6. Wary of the consequences, Phivolcs has in place a contingency plan to evacuate the entire volcano island as well as the lakeside villages of Talisay, Tanauan City, Agoncillo, Balete, San Nicolas and Laurel should the volcano exhibit symptoms of the same magnitude and nature as the 1911 eruption6. Image credit: John Tewell's collection on Flickr. 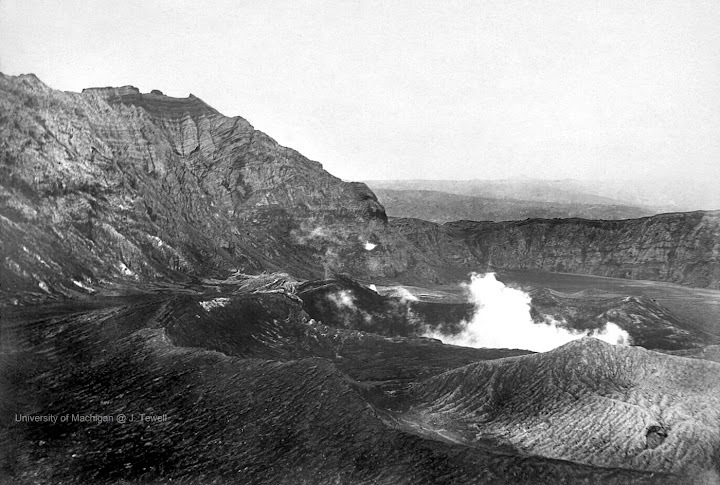 Inside the Main Crater of Taal Volcano in this 1911 picture. According to the author Jay Robert Nash, writing in his book “The Darkest Hours,” the 1911 Taal Volcano eruption occurred on the 30th of January. It was preceded by earthquakes that shook the countryside surrounding the volcano as far as 100 miles (160 kilometers) away8. This meant that the tremors would have been felt as far north as Baliuag in Bulacan and as far south as the island of Mindoro. These went on unceasingly for a day then, just before the explosion, the volcano started to emit columns of black smoke. Image credit: John Tewell's collection on Flickr. 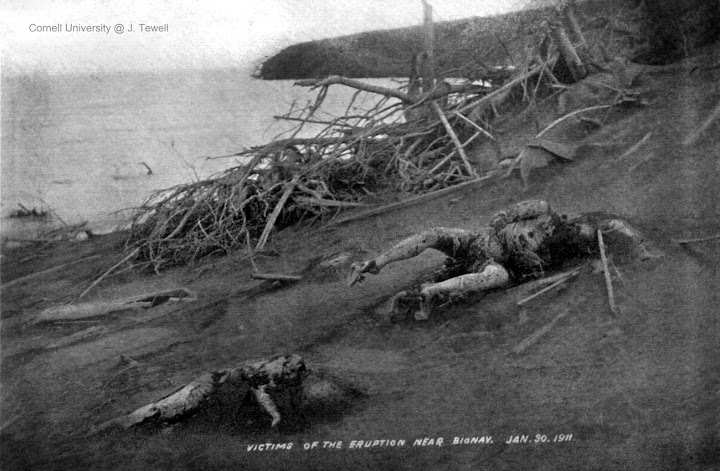 Victims of the 1911 Taal Volcano eruption. Nash also described how one villager who was awakened by the explosion watched how his son, who had run to the door, was instantly killed by a thin layer of boiling mud. Meanwhile, in another village, a man awakened to find the same boiling mud beginning to fall from his roof. He barely managed to escape, running from his house to dive into the lake and swim to safety. Taal Volcano went quiet for 54 years after this cataclysmic 1911 eruption, and the next time it went up again, in 1965, it was not as violent and casualties were limited to just 200 persons. There were seven more mild eruptions since, the last being in 1977. This means that Taal Volcano has been relatively quiet for all of 40 years; and it has been 52 years since the last violent eruption of 1965. Not that this really means anything because there does not appear any numerical patterns to the intervals between its violent eruptions. For instance, the violent 1754 eruption was preceded by another violent one in 1749 just five years earlier. However, after the 1754 eruption, the next violent one was in 1911 which was 157 years later. What we do know is that Taal Volcano is more than just a postcard picture. It is a deadly killer which will likely rise up again. Just when is what we do not know; but we can all keep praying it will not happen soon, especially if it will be anything like the 1911 eruption. 1 “List of volcanoes by elevation,” Wikipedia. 2 “Taal Volcano Historical Eruptions,” online at the Phivolcs web site. 3 The USGS defines a phreatic explosion as “steam-driven explosions that occur when water beneath the ground or on the surface is heated by magma, lava, hot rocks, or new volcanic deposits.” USGS web site. 4 Seiches are similar to tsunamis but they occur in enclosed bodies of water such as lakes and reservoirs. Wikipedia. 5 A base surge from a volcanic explosion is made up of clouds of gas and ashes that shoot outward from the source of the explosion and move close to the ground. Volcano Discovery. 6 “At Risk: Natural Hazards, People's Vulnerability, and Disasters.” Published 1994 in New York, by Piers M. Blaikie, Terry Cannon, Ian Davis and Ben Wisner. 7 “Taal Volcano,” online at the Phivolcs web site. 8 Along with other information contained in this article, from “Darkest Hours,” by Jay Robert Nash published 1976 in Maryland, USA.